The first track “Federal Funding,” albeit political satire, is boring as hell and a poor selection to birth the album. (Also poor way to birth a review, but my hands are tied.) “You received the federal funding, you can add another wing” is an obvious face-smack to those bailout bastards but the track also made me want to bailout of the album. The album is heavy with recognizable CAKEisms: horn solos, lots o’vibraslap, heavy bass lines, and never-ending cattle calls and grunts by the all-man band. But it also Â includes more piano which is a mature progression from previous CAKE albums. 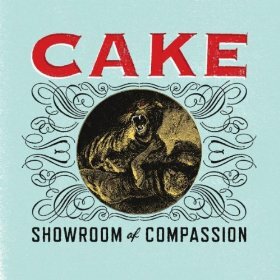 Showroom of Compassion is everything CAKE should be, is, and is not. It’s familiar yet different. It’s drollsome and snarky yet inspiring, surprising, and worthy of fan returnmanship. Welcome back, CAKE, you’ve been missed.